FEEL THE HEAT IN 1 MIN - Kingleting heated seat cushion is outstanding in increasing the temperature quickly within 1min, providing cosy warmth for your full back, hips and thighs. The highest temperature is able to be adjusted to 60℃(140℉). INTELLIGENT TEMPERATURE CONTROL - Our unique temperature controller makes you able to choose the temperature from 30 ℃(86℉) to 60 ℃(140℉) every 3 ℃(37.4℉) freely. TIMING POWER-OFF PROTECTION - If you forget turn off the switch, don't worry, this protection provides you with timing choices in every 30 minutes, 60 minutes or 90 minutes to avoid battery drain! Even if you don't want the timing protection, feel free to choose "00" option! 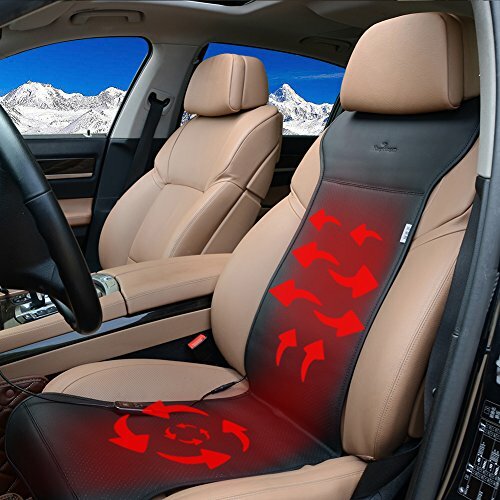 SAFE & RELIABLE - For you safety, the heated seat cushion is equipped with a protection thermostat that keeps the cushion from overheated. When the temperature reaches what you chose, it will automatically stop increasing and constantly keep the temperature you want. Once the temperature gets lower, the heater will work automatically again to rise the heat up. FIT UNIVERSALLY - The heated seat cushion nicely fits most standard types of cars, SUVs, and RV seats, designed with non-slip rubbers on the bottom, and equipped with elastic bands to fasten the cushion to the seat and keep it in place perfectly.